The dispossession that we have faced as indigenous people is the pain that unites us in the spirit of struggle that we commemorate today in honor of our compañero David Ruíz García, who passed away while sharing the pain of the brothers and sisters from the Zapatista National Liberation Army after the murder of compañero Galeano. We become one in our history and in our hopes. The death of the compañero, who is today collectively reborn among the 28 peoples, colors, and languages that are gathered in the Zapatista Caracol of La Realidad, inspires us as original peoples to share the happiness of encountering each other; of knowing each other to be as alive as are our peoples, our languages, our collective history that becomes our memory, our resistance, and our accountability to mother earth, who also lives and to whom we are indebted. From the beginning, capitalism has grown through DISPOSSESSION and EXPLOITATION. PLUNDER and INVASION are the words that best describe the so-called conquest of America—plunder and theft of our territories, of our knowledge, of our culture. DISPOSSESSION, accompanied by wars, massacres, imprisonment, death upon death; these create a life in common because here we are as the peoples that we are, that we continue to be. We have responded to our dispossession and extermination with rebellion and resistance. Hundreds of rebellions in Baja California, Sonora, Chihuahua, Nayarit, Jalisco, Guanajuato, Michoacán, Querétaro, Veracruz, the State of Mexico, San Luis Potosí, Hidalgo, Morelos, Puebla, Guerrero, Oaxaca, Chiapas, Yucatán, Campeche, and Quintana Roo, and notably, the Zapatista revolution, defied colonial society. All of these took place after the liberal reforms, giving rise to the armed movement of 1910 and the armed defense of communal lands up until the era of the agrarian reforms and Cardenista oil expropriation. Currently, the neoliberal capitalists, with the assistance of all of the political parties and bad governments led by the criminal paramilitary boss Enrique Peña Nieto, are applying the same policies of large-scale dispossession applied by the nineteenth-century liberals—the Carranzas, the Obregons—propped up by militarization and paramilitarization and advised by U.S. intelligence in areas where there is resistance to the dispossession. Mirror 2: The Nahua and Totonaco territories in Totonacapan, Veracruz, have been destroyed by electric power plants, the release of flared gas, and toxic spills from damaged pipelines that have devastated the region’s water sources. All of this is part of the Proyecto Paleocanal de Chicontepec, now known as Tertiary Gulf Oil, where 29 oil fields are being exploited in an area of 3,875 square kilometers, with 1,500 oil wells across 14 municipalities in the region, destroying rivers and streams through hundreds of spills originating from 2,220 well overhauls that were made up until the year 2010. Currently there is a threat of 33,000 more well overhauls according to the National Commission of Hydrocarbons. Fracturing has been carried out through the detonation of dynamite, and hydraulic fracturing (fracking) in 1,737 wells in the entire zone. In that same area numerous mining concessions have been granted that put at risk the integrity of the territory. Mirror 3: The Wixárika people, despite the fact that they encompass parts of the states of Jalisco, Nayarit, and Durango, have maintained their continuous territory and their autonomous organization is strong and ancestral. Today they face an onslaught on simultaneous fronts: past agrarian invasions which, despite restitution having been ordered in favor of the community San Sebastián Teponahuaxtlán, continue without enforcement of restitution due to blurry delimitations between states. Their territory has been subjected to the imposition of highways whose objective is the plunder of the region’s natural resources, as has been the case of the community of Santa Catarina Cuexcomatitlán, which since 2008 has mobilized large protests to halt the imposition of the Amatitán-Bolaños-Huejuquilla Highway. Currently the government of the state of Jalisco refuses to repair the damages caused to their forests, communal roads, and sacred sites, despite the fact that the community obtained legal rulings in its favor. Mirror 4: In the Municipality of Villa Guerrero in Jalisco, the Autonomous Community Wixarika-Tepehuana de San Lorenzo de Azqultán, in spite of holding a viceregal title since the year 1773, have not received recognition for their own territory. On the contrary, the land that has always belonged to them has now been put at the mercy of the caciques [land bosses] and governments. The forest is being cut down, the territory invaded, and their sacred sites destroyed, such as in Cerro Colotlán where the bad government has given the landowners endorsement and money to carve up ceremonial stones for use as stone barriers supposedly to protect the soil. This is not only dispossession, but rather genocide. In the same area of the Isthmus, Oaxaca’s region of San Miguel Chimalapas and Santo Domingo Zanatepec was invaded by three mining concessions granted to the Cruz Azul Cooperative for the mining lot they refer to as El Chincuyal, to Cascabel Mining for the mining lot called Mar de Cobre, and to Zalamera Mining for the mining lot called Jackita, a subsidiary of the Orum Gold Mining Corporation—whose reach stretches across 7,310 hectares of our peoples’ lands. The Chiapas state government, rich cattle ranchers, and the Mexican Army are carrying out the invasion. Mirror 6: In the ñatho communities of San Francisco Xochicuautla and Huitzizilpan, as well as in a wide strip of land called Alto Lerma in the State of Mexico, a private road project called Toluca-Naucalpan is being imposed by the Autovan corporation. It will affect a total of 23 kilometers of forest, in addition to the construction of thousands of homes and golf courses as part of the project called Gran Reserva Santa Fe. Our brothers from the Indigenous Peoples Front in Defense of Mother Earth defend this territory. 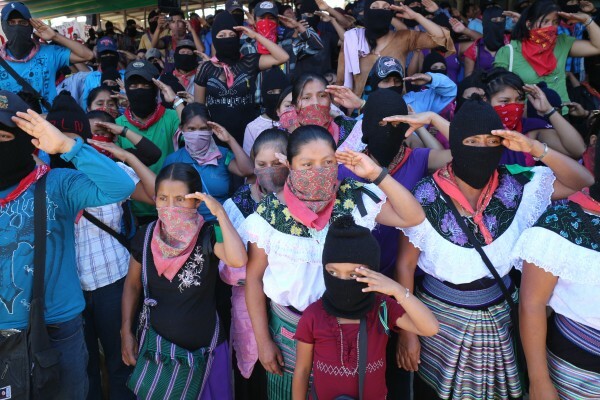 Mirror 7: In the Nahua community of Tuxpan, Jalisco, under pressure by the bad governments and national and international investors, the indigenous people have had to lease out ejidal lands to transnational avocado companies headquartered in Michoacán. Foreign greenhouses such as Driscolt and Aguacates Los Tarascos, which are engaging in weather modification schemes that prevent rain, are dispossessing these communities. Mirror 11: In Amilcingo and Jantetelco in Morelos, the eastern Nahua region of the state and in the Nahua region of Valle de Puebla, in the communities San Geronimo Tecuanipan, San Lucas Atzala, San Andres Calpan, Santa María Zacatepec, San Lucas Tulcingo, Santa Isabel Cholula, San Felipe Xonacayucan, Santa Lucia Cosamaluapan, San Isidro Huilotepec, San Buenaventura Nealtican, San Juan Amecac, and in other communal regions of Puebla and Tlaxcala, the Integral Morelos Megaproject intents to construct a 160 kilometer pipeline in an area of volcanic risk. This Project is promoted by the CFE, the Spanish corporations Elecnor and Enagas, and by the Italian corporation Bonatti. Over the last two years, the three levels of government in their respective states have exerted brutal repression on all of these communities. The people of Maya de Bacalar, in the state of Quintana Roo, are suffering the imposition of transgenic soy cultivation that poses great risk to the native seeds, health, and food of the indigenous people. Companies such as Monsanto, Singenta, and Pioneer do this with the complicity of the bad governments. The Maya people of the Yucatan are threatened by various megaprojects, such as the Dzilam de Bravo wind farm, the planting of transgenic corn, the Trans-peninsular train project, and real estate development, which benefit a handful of businesses and corrupt politicians. Mirror 28: The community of Nurío Michoacán on the Purépecha Plateau was stripped of the majority of its territory through resolutions dictated by the Mexican agrarian authorities that provoked conflicts between neighboring communities resulting in numerous deaths. Our memory is alive because we ourselves are that memory to which we are indebted. We understand that there is no better memory than that of our peoples, and as we gather now in order to see each other we see that our struggle will not end; if they haven’t killed us off in these last 520 years of resistance and rebellion, they won’t be able to do it now, or ever. We are people of corn; we know that the milpa is collective and its colors are diverse—so diverse that we also want to give ourselves one name: rebellious and anti-capitalist, with the brothers and sisters of the National and International Sixth. Today, like the corn, we renew our decision to construct from below and to the left a world where many worlds fit.